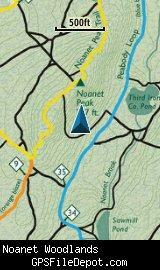 The Noanet Woodlands is a 595 acre parcel of land owned by the Trustees of Reservations. The highlight of the property is the view from Noanet Peak. The best access to Noanet Woodlands is through the Town of Dover's Caryl Park, although it can be accessed from other trailheads. Noanet Woodlands borders Hale Reservation and is very close to Powisset Farm. Trails connecting these three properties (plus Caryl Park) provide access to a total of almost 2000 acres of conservation land. 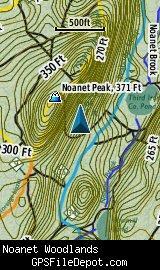 This KMZ map is set to Draw Order 40 so it will show 'beneath' your primary map on your Garmin KMZ-compatible GPS. It will also show above my KMZ map of Hale Reservation and above my KMZ map of Powisset Farm if you have them loaded on your GPSr. Loading all three KMZ maps will provide you with a seamless trail map of all properties on your GPSr. See the links above to view all three maps together. Version 7 of Google Earth introduced a new 'feature' - when opening KMZ files, the view automatically 'tilts' to an oblique angle. By specifying the tilt angle (zero) in the KML file, this version of the Noanet Woodlands KMZ map (1.01) prevents Google Earth from tilting the view. There were no other changes to the map - so if you don't mind the tilt view in Google Earth, or if you are not using this KMZ file in Google Earth, there is no reason to download this update. Initial release using Trustees of Reservation map dated September 2010.